GUESS WHO CAN SUE THE GOVERNMENT TRAPPERS IN NEVADA!! International trade is fueling California’s bobcat fur demand, but pressure from conservation and citizen groups is pushing the state to look at an all-out prohibition on commercial bobcat trapping. The act came about after it was discovered that trappers were ambushing bobcats on private land and in areas just outside Joshua Tree National Park. The public outcry played a role in pressuring the state to move quickly on the issue. But as things often go in politics, by the time Gov. 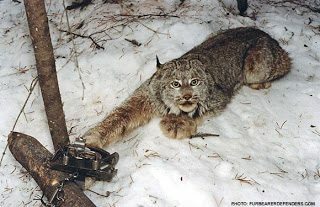 Jerry Brown signed the bill, it had been workshopped into an amended semi-ban on bobcat trapping—creating no-trapping zones around national parks and wildlife refuges but allowing it elsewhere. In other words, the trapping problem near Joshua Tree had been solved, but much of the rest of the state was still fair game. That’s allowed commercial trappers to keep making a pretty penny selling pelts overseas, thanks in part to growing demand in China and Russia. Today, bobcat pelts are fetching between $200 to $600 for just one clean, white belly fur hide—quite an increase from the $78 a bobcat pelt fetched as recently as 2009. Those rising pelt prices fueled a 50 percent increase in California bobcats killed in 2012 compared with the previous year, resulting in 1,813 bobcats taken from the wild. Now only a year and a half after the passage of the bill, wildlife officials are once again getting an earful from the public, with conservation groups and citizens calling for the full ban to be instated—and an end to the pelt trade for one of the last U.S.-based species of wildcat still for sale on the international market. At a state Fish and Game Commission meeting last week, officials reviewed their options and heard from the public on the bill: Around 40 people spoke in support of a total ban, with only four members speaking against it. “Right now, the fate of bobcats is tied to the rise and fall of its fur prices in the international market, instead of a science-based plan,” said Brendan Cummings, senior counsel for the conservation group Center for Biological Diversity. Click HERE for original and complete article. 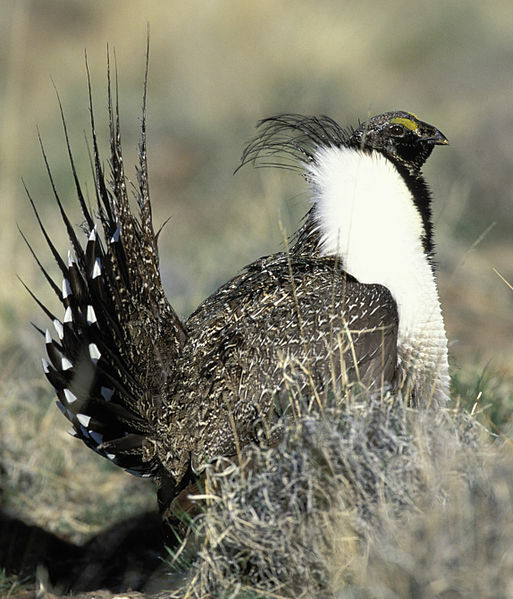 SAGE GROUSE HUNTING IN NEVADA 2000 – 2013: DO WE REALLY NEED TO DO THIS? Since the year 2000, Nevada hunters have killed over 60,000 sage grouse in Nevada while, at the same time, the bird has been subject to much scrutiny as to whether it warrants listing under ESA. Here’s the weird part: the Nevada Department of Wildlife and the Nevada Board of Wildlife Commissioners claim that this killing actually benefits or does no harm to the bird….a notion called compensatory mortality…a notion used to justify all hunting and trapping. The contrary notion….additive mortality….is what happens when one raven takes one egg from a sage grouse nest and chaos ensues for sage grouse. Such is the state of “notions” these days in wildlife management regarding sage grouse hunting by human predators. $14 Million donated to Wildlife Conservation – so animals can be trapped? The website is full of beautiful images: moose, owls, endangered species and traditional landscapes. Their conservation work is impressive, protecting various habitats and affecting policy. The problem? They’re not entirely up front. The Canadian Wildlife Federation, a national organization that took in some $14,000,000 in donations last year, is affiliated with groups dedicated to promoting hunting, fishing and trapping. But to look at their website, annual reports or even their organizational description, one would have no idea of these associations. All are groups that focus on the preservation of “resources” for “recreational” or “mixed-use.” Which translates to hunting, fishing and trapping. As we’ve already stated, they’ve done impressive conservation work. But the devil is in the details – and those details are hidden deep down. We know that many people donate to the Canadian Wildlife Federation because they believe in their work. And we won’t tell these people not to donate to whomever they choose. But we do want people to understand, fully, what they’re donating to. We want people to be assured that the organizations they’re supporting have policy statements or values that reflect their own. Please note that the CWF is not the only conservation organization with these types of ties – there are many out there. We want people to ask questions – and find the truth. Don’t let non-profits take advantage of your love for animals. BISMARCK, N.D. (AP) – North Dakota will not have a bighorn sheep hunting season this year for the first time in more than three decades. The state Game and Fish Department is making the move because of the deaths of dozens of sheep last year in the western Badlands due to bacterial pneumonia in the herd. Many of them were mature rams, according to Jeb Williams, the agency’s wildlife chief. Most of the sheep had been transplanted from Alberta, Canada, about a year ago. State wildlife officials said the wild sheep likely were infected by domestic sheep, though sheep ranchers questioned that theory. The last time North Dakota did not have a bighorn sheep hunting season was 1983. “The summer 2015 (bighorn population) survey will provide more information as to when Game and Fish may be able to re-establish a sheep season,” Williams said. Bighorn sheep licenses are once-in-a-lifetime licenses in North Dakota – meaning hunters who get a license cannot get another one even if they fail to bag a sheep. One license is given out every year through an auction to raise money for sheep management, and the rest are given out through a lottery drawing. All five hunters who got a bighorn license last year bagged a ram. Moose and elk licenses also are once-in-a-lifetime licenses in North Dakota. Both of those hunting seasons will have more licenses available this year than in 2014. Game and Fish said 301 elk licenses will be made available, up 40, and there will be 131 moose licenses, up 20. 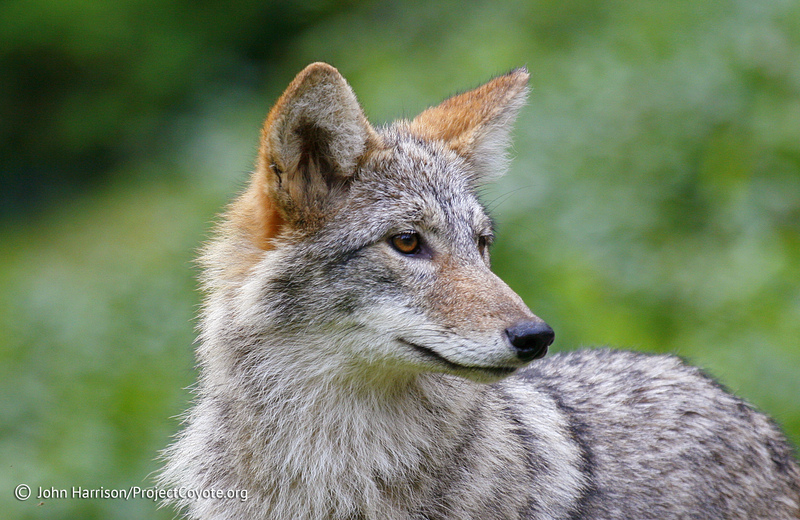 Hey, Wildlife Services – what did you kill? Wildlife Services spokespeople say that all lethal control efforts, from putting down raccoons to prevent the spread of rabies to controlling expanding wolf populations, are based in sound science. But the agency’s 665-page information dump provides little context for individual killings. That’s not out of character for Wildlife Services, which Rep. Peter DeFazio (D-OR) has called “one of the most opaque and obstinate departments I’ve dealt with.” Fear not: High Country News has sifted through the report to help our readers make sense of the slaughter. 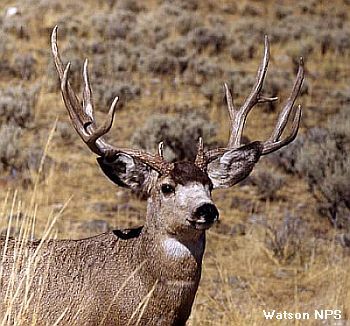 Scroll through the below interactive infographic to experience a year in Wildlife Services’ campaign of lethal control. In “EXPOSED” you’ll see three former federal agents and a prominent Congressman blow the whistle on the USDA’s barbaric and wasteful Wildlife Services program and expose the government’s secret war on wildlife. Watch film. Jane Goodall has given “EXPOSED” a rave review and said she wants millions to see it. It also won Best Short at the 2015 Animal Film Festival and Best Wildlife Activism at the 2014 Wildlife Conservation Film Festival, the premier wildlife film festival in N. America. An agency within the USDA called Wildlife Services—a misnamed entity if there ever was one—has been having their way for almost a century, killing millions of wild animals a year, as well as maiming, poisoning, and brutalizing countless pets. They have also seriously harmed more than a few humans. And they apparently think they are going to continue getting away with it. But in our new documentary, EXPOSED: USDA’s Secret War on Wildlife, whistle-blowers go on the record showing Wildlife Services for what it really is—an unaccountable, out-of-control, wildlife killing machine that acts at the bidding of corporate agriculture and the hunting lobby, all with taxpayer dollars. Our call for reforming this rogue agency is getting serious attention. A teaser of EXPOSED was featured on CNN Headline News and is slated for an upcoming special segment. We’re also working to get a CBS “60 Minutes” exposé. In 2015 we are kicking off a nationwide film screening tour. Whistleblower Rex Shaddox will attend some of our screenings and we hope to have other speakers tour with us if we can raise enough funds. Click HERE for the complete, original article.